The B-cell lymphoma 2 (Bcl-2) family proteins play an important role in regulating apoptosis, or programmed cell death, in response to several extracellular and intracellular signals. These proteins are either pro-apoptotic or anti-apoptotic. The pro-apoptotic Noxa is a Bcl-2 family protein that belongs to a subclass of BH3-only proteins. Noxa induces apoptosis via p53-dependent and/or p53-independent mechanisms. 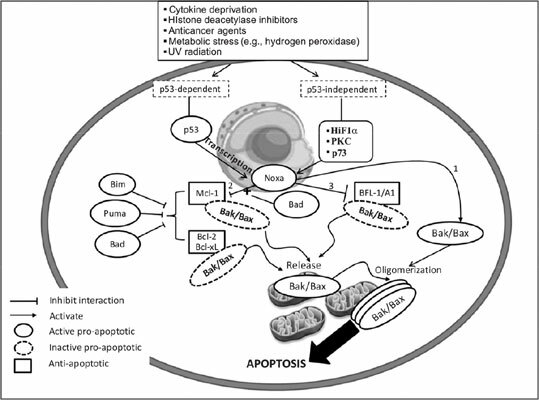 While Noxa may play a limited role in apoptosis, it is a crucial player that interacts with several proteins in the apoptosis pathway, highlighting its importance in the pathogenesis and treatment of certain cancers. In this review, we will elucidate the mechanisms by which Noxa regulates apoptosis and review the roles of chemotherapeutic drugs in relation to Noxa. Bcl-2, apoptosis, Noxa, cancer, B-cell lymphoma 2, p53.